rhubarb is an absolute favourite of mine. i love the tangy flavour and always get ridiculously excited when it is season. however, rhubarb brings out a frugality in me, which i am always surprised by. the beautiful pale pink forced rhubarb is always priced at a level which makes me wince - £3 for a mere untrimmed 400g which, once it is cooked, is only just enough for 2 portions. still, there are some things in life which are too beautiful to resist, and as it has been many a month since i bought pretty shoes or a gorgeous handbag, i think a bundle of rhubarb is deserved. don't forget to share your favourite fruit recipes with me, for the spring fruit sensationsmonthly mingle! 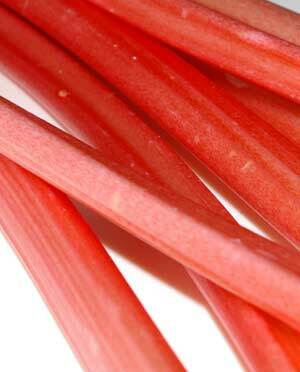 mix the rhubarb, sugar and vanilla seeds in an ovenproof dish. cover with foil and bake until the fruit is completely soft (c45 minutes). leave to cool then eat. variation: omit the vanilla and instead add the zest and juice of an orange plus an inch of finely grated ginger.